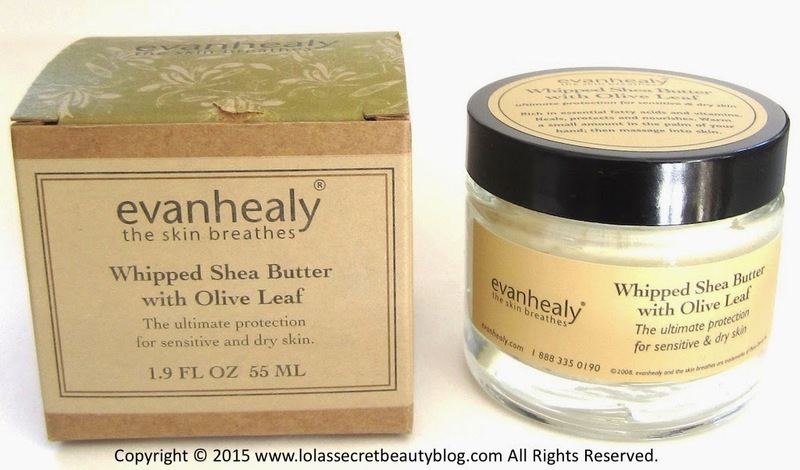 It has been a while since I have sung the praises of evanhealy skincare products, but as I reached for my evanhealy Whipped Shea Butter with Olive Leaf– it occurred to me that I had yet to share this luxurious Shea Butter treasure with you. If you love Shea Butter, then this is whipped version will leave you deliriously happy– as it does for me each time that I use it. It is far more user friendly than the traditional Shea Butters that I have used since the whipped texture makes it feather light, and it absorbs more readily. You simply warm a small amount between your hands and massage it anywhere you need added moisture and hydration, and the effects are miraculously fast. It has a warm and subtle scent that might be likened to the smell of cocoa butter, and as delectable as it smells it does fade so as not to interfere with any fragrances that you may be wearing. It leaves skin hydrated, soft, supple, nourished and luminous. 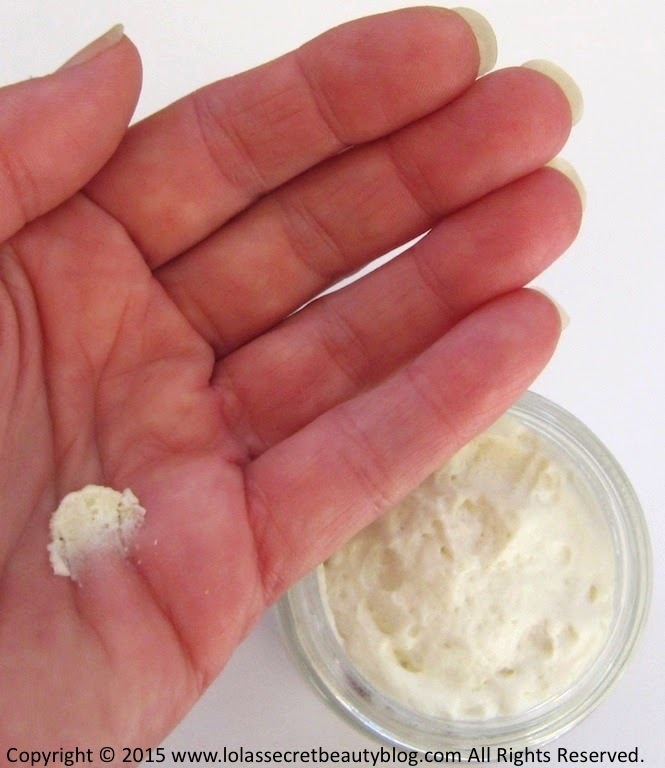 You can use it from head to toe, but if you have very dry skin you may find this the perfect facial moisturizer. If you have dry curly hair, this does wonders to nourish distressed tresses! A finger-tip sized amount applied daily to clean skin rejuvinates and protects extremely dry and dehydrated skin, having a remarkable effect on wrinkles, softening and smoothing fine lines, wrinkles, all signs of stress held in our face and eye area. After a few days of consistent use skin appears noticeably improved. Our Whipped Shea Butter, rich in essential fatty acids, cinnamic acid, and vitamins C, E, and K, heals dry, sensitive skin conditions while providing maximum barrier protection without a heavy feeling or clogging tiny dermal pores. It is especially effective when treating red/angry skin conditions. Our Whipped Shea Butters are a combination of luscious and nourishing oils: California- grown extra-virgin olive oil, calendula-infused sunflower oil, and a Madagascar vanilla- infused coconut oil. These restorative and concentrated butters are prepared by hand in small batches. Over a period of four to six hours we slowly add each oil into the raw unrefined shea butter as it gently and continuously whips. At the end, we add the flower remedies of Self Heal and Crab Apple. Our Shea Butter comes to us from the Tapko Widows Group, a small community of women in northern Ghana. This remarkable group of women hand-harvest and process the shea nuts into shea butter using labor-intensive, traditional methods that have been handed down over centuries. The Tapko Widows are paid a premium price and a percentage of sales goes to a micro-credit project in their support, complementing their subsistence agriculture-based economy. Tapko is a small village located near the Burkina Faso border in Ghana's Upper West Region. We make our Whipped Shea Butter in house and by hand, it takes four to six hours of continual whipping to reach its rich, creamy, fragrant softness. The ultimate protection for sensitive and dry skin. This truly unrefined product has been extracted without chemical solvents, cleansers or bleaching agents. As a result small granules may occur, which in no way compromises its quality, and will dissolve instantly when massaged into skin. Variations in color and fragrance may also occur. Unrefined shea butter is high in valuable unsaponifiables, which add emolliency and softness to skin. Vitamin E protects against oxidation, and naturally occuring phytosterols contribute to cell membrane integrity. 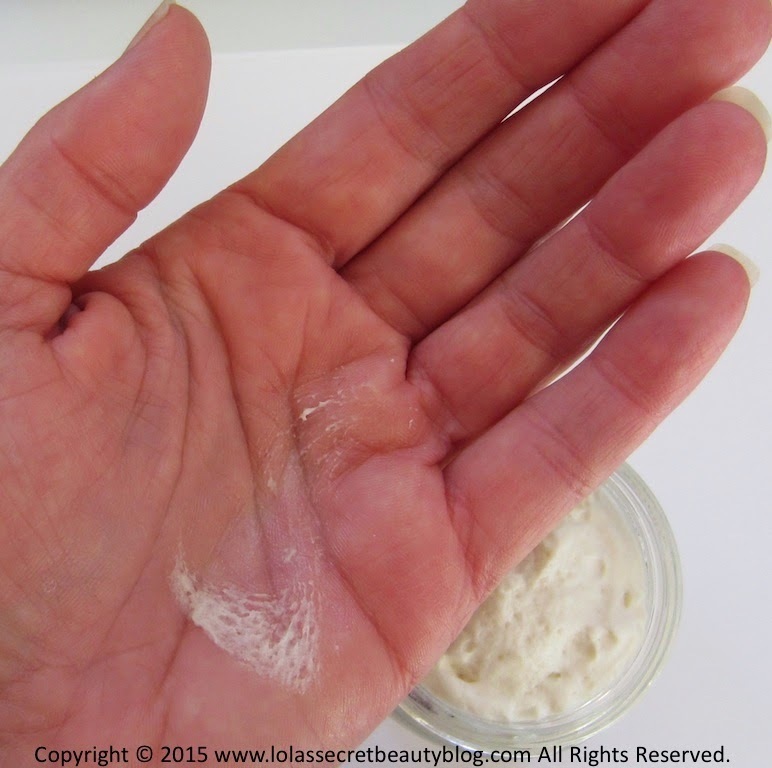 As a daytime moisturizer: "Taking a finger-full of Shea Butter warm and soften between the palms of your hand. Massage into area of face or body to be treated. Finish by misting with of one of our Facial Tonic Hydrosols to increase hydration and penetration." As a Shea Treatment Mask: "An alternative to our Clay Treatment Masks, our Whipped Shea Butters make ideal regenerating, nourishing and restorative treatments for dry and/or sensitive skin in need of rebuilding from over-use or over-reliance on harsh glycolic (AHA) treatments, fruit enzymes, or dermabrasions; it also makes a great hair conditioner!" No GMOs, parabens, petroleum-based products, synthetic fragrances, or animal testing. Vegan. Ingredients: Shea (Butyrospermum Parkii) Butter, Olive (Olea Europaea) Fruit Oil*, Vanilla Plantifolia Extract (and) Coconut (Cocos Nucifera) Oil, Calendula Officinalis Extract* (and) Sunflower (Helianthus Annuus) Seed Oil*, Olive (Olea Europaea) Leaf Extract*, Lavender (Lavandula Angustifolia) Extract, Carrot (Daucus Carota Sativa) Seed Extract, Nettle (Urtica Dioica) Extract, Sweet Violet (Viola Odorata) Extract, Ylang Ylang (Cananga Odorata) Flower Oil, Frankincense (Boswellia Carterii) Oil, , Lavender (Lavandula Angustifolia) Flower Oil, Vitamin E (Tocopherol), Flower Remedies. * Certified organic ingredient. Fresh plant infusions of olive leaf and rose petal in olive oil, Madagascar vanilla in coconut oil, and Calendula blossoms in sunflower oil, make our Whipped Shea Butter an excellent source of essential fatty acids, vital phyto-nutrients and antioxidants. Overall Assessment: If you buy one Shea Butter, it should be this one! I use mine all of the time, and even use it as a lip balm. This is an A+ product from a truly extraordinary line! $29.95 for 1.9 oz. from evanhealy, Pharmaca & Amazon (Affiliate Links). my darling,! It always happens to me that you review something I have been looking for right after I purchased something similar! I just bought my usual body butter (Frederic Malle) and a body serum (Sunday Riley) and both were crazy expensive :( whereas this sounds delightful and it is very affordable. I may still just buy it and see how it is. They have it at my local Whole Foods. How is life my sweets? Any news about your TT? Nothing on my end and I guess I already run out of choices. But, here we are, alive and kicking so I'll have to wait another year. I hope you have had better news. Hello my darling! That is so funny! This is definitely worth getting– especially since it is so accessible at your local Whole Foods! I really think that you would like this a great deal! Just hand it right over! 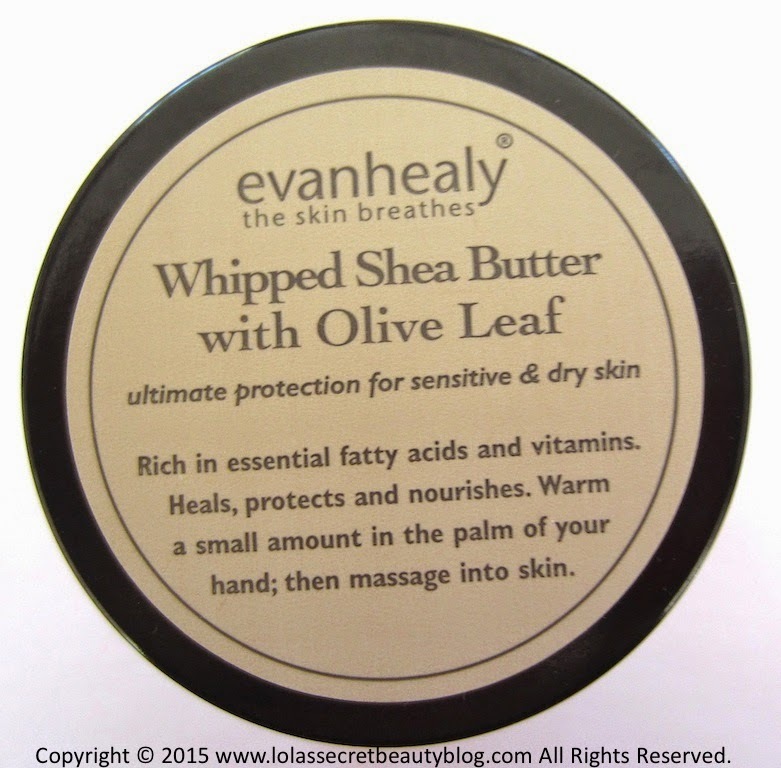 I adore whipped shea butter, and the olive leaf makes it even more enticing! You really need to try this one, Allison! It is sublime! How strong is the scent? I had to give up on the Evan Healy products I had after a while because it just felt too strong for me. I don't find the scent too strong, but given your sensitivity to smell coupled with your need to discontinue using your evanhealy products– I would suggest smelling it first. If you have a Whole Foods nearby you should check it out there before committing to the purchase. This sounds heavenly... I'd love to use it as a mask! It is heavenly, Brooke! It is amazing as a mask! It is absolutely amazing as a mask! It really is amazing! Thank you for saying that! I really tried to capture the light and airy whipped texture! It is really wonderful, and definitely worth trying! I'm pretty obsessed with it! It really is heavenly! It is so effective at banishing dry skin, and it is more effective than heavy hand creams at moisturizing dry hands! It's pretty amazing! Oh my... I love whipped body or hand butters... I want this. How about the scent... I'm sensitive to smell and wonder if it may be too strong for me. Thoughts? Whipped butters are amazing, I agree. The scent on this one isn't overpowering, but if you are sensitive to smells then it weight be worth tracking down in person to sniff it first! They sell them at Whole Foods Market, if you have one nearby. You can also go to the evanhealy website to look at the store locator to see where it is sold in Hawaii. It is a superb moisturizer, and it would be great for you if the scent didn't bother you. 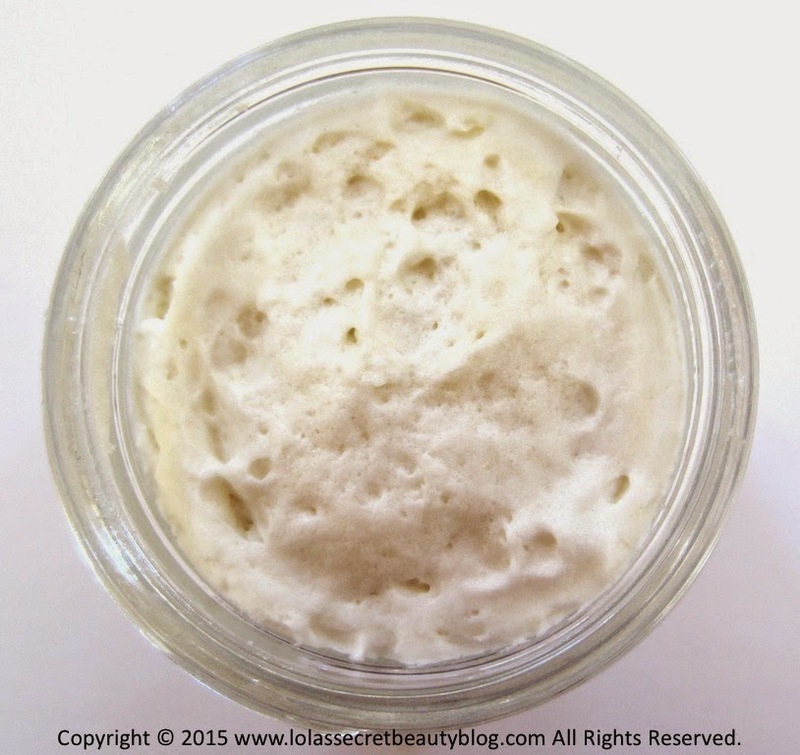 It is an amazingly moisturizing and feather light whipped shea butter! It is definitely worth trying, Kristin! I looks and sounds so good! Love that you can use it as a mask. It's amazing stuff, and the texture is fantastic! It works tremendously well as a nourishing mask, and it leaves the skin feeling and looking amazing!